They are works of architecture, historical engineering, and art which connect a dozen islands within the city of Wrocław. Soon, the centuries-old history of more than 100 bridges will be brought to the public by an array of artists. The curator of the Mosty (Bridges) project, Chris Baldwin, explains that "for one day, we are going to stop the city, and transform these bridges into cultural sites". According to Baldwin, the aim is to find an interesting story which will inspire groups of young people to take over a bridge, transforming it into the venue of a cultural or artistic happening. A whole series of events will take place in June 2015. The finalisation of the project is to coincide with the official announcement of the programme for Wrocław’s year as European Culture Capital in 2016. 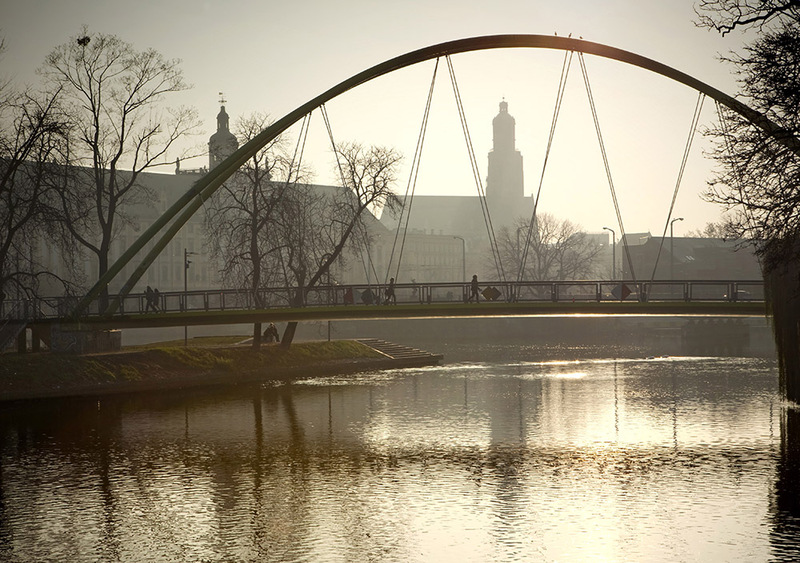 Meanwhile, Culture.pl invites you to take a brief virtual tour across the bridges of Wrocław – our Venice of the North. Bending under the weight of love, Tumski Bridge is a hallmark of the city and one of its most romantic sites. 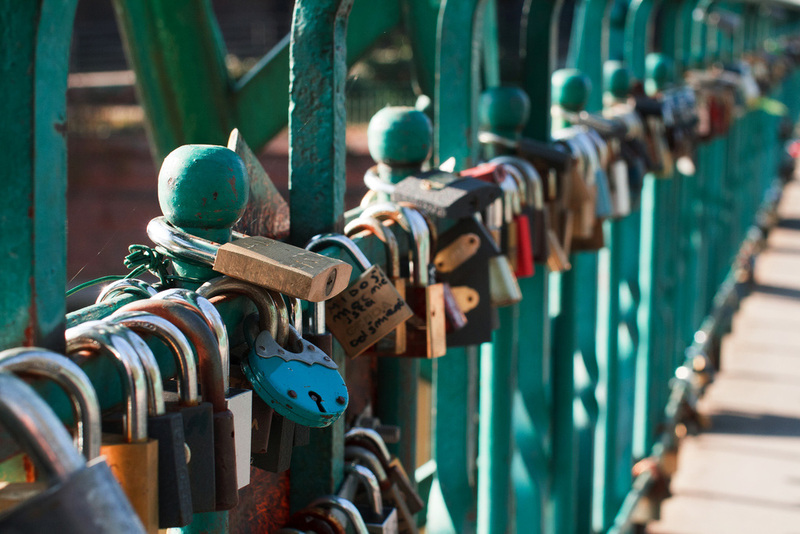 Specialists estimate that the collection of padlocks with carved lovers’ initials must weigh about 500 kilograms. The padlocks hang on the historic iron spans of a bridge whose construction followed a centuries-long tradition. The very first records of a passage between the former Ostrów Tumski city and the Piasek island date to the 12th century, and are connected to the construction of a Roman cathedral. The very first bridge in this place also constituted a border of the ecclesiastical jurisdiction – with a landmark bearing the Czech and the bishopric emblems. 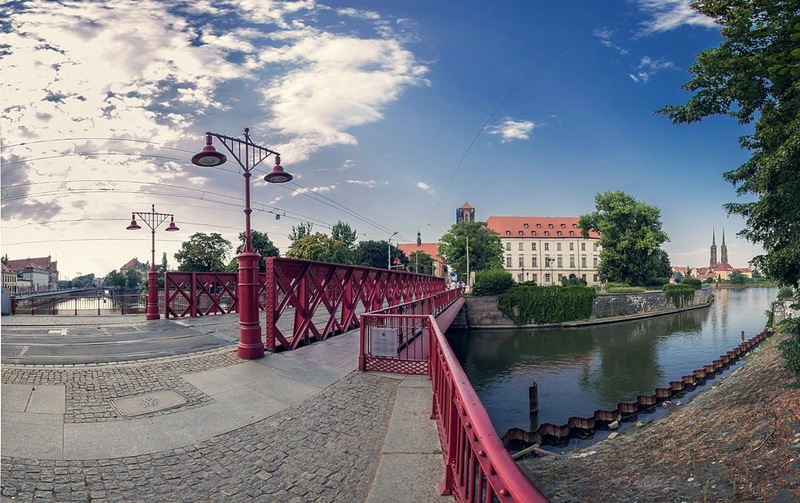 Lit up with gas lanterns, the Bridge of Love was also witness to bloody moments in history – some of its elements still bear traces of shooting from the 1945 Festung Breslau siege of Wrocław – one of the last battles of World War II. Since 1983, two neogothic figures adorn the entry onto the bridge on the island side. The patron of Silesia (St. Hedwig), and St. John the Baptist, sculpted by the Wrocław-based artist Gustaw Grunenberg. A couple of centuries ago, it was just a modest wooden footbridge which lead onto the meadows surrounding the Odra and Oława rivers. It is said to have been used mostly by Walloon weavers who dwelled in the nearby Oławskie suburbs. This area was often called St. Moritz, due to the name of the patron of a local church. Hence, the name of the bridge first raised in this place – Most Maurycego (Mauritusbrücke, meaning Moritz’s Bridge). It was raised between 1882 and 1883 according to the design by Aleksander Kaumann, and his collaborators, the engineers Eger and Reichelt. Its construction, which is evocative of bridges found in Rome and Paris, is based on arches, with stone and granite supports, as well as pillars and abutments. The bridge is decorated with balustrade railings and neobaroque sculptures which depict mythological figures connected to the realm of water. Those who promenade on the bridge walk in the light of gas street lamps, which were based on the original etched designs from the year 1885. One of the oldest ports of Wrocław, the Ujście Oławy, is located right by the bridge. 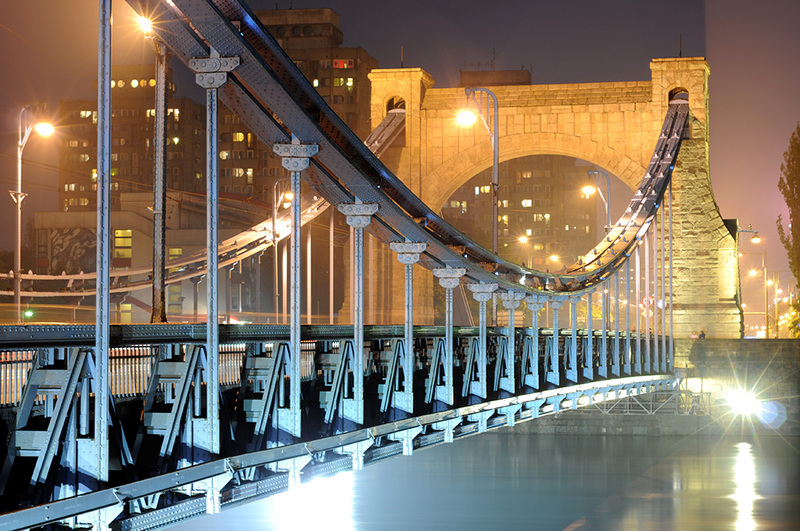 An icon of the city, and once one of the most modern suspension bridges in the world. Raising the Grunwaldzki Bridge, based on a design by a prominent German architect, Richard Plueddemann, took 2 years, and it was completed in October, 1910. The official opening was attended by Emperor William II. 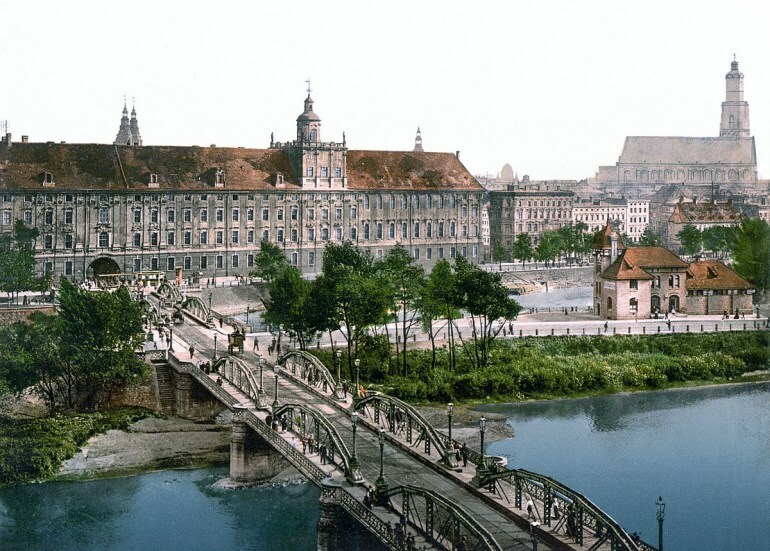 Until 1918, it was called the Cesarski (Imperial) Bridge, Kaiserbrücke in German. After the First World War, at the time of the Weimar Republic, its name was changed to Most Wolności (Freedom Bridge), or Freiheitsbrücke, and under Hitler, the name Kaiserbrücke was restored again. This bridge remembers mass displacements of people, and also a bomb raid during which it was partially destroyed. For long centuries, I stretched myself wooden above the lazy waters. Now, made of iron and stone, I decorate a new waterway. The bridge was also called Ceglany (Brick) and Przepustkowy (Passing) The latter name is due to an epidemic of cholera in 1704, when a special checkpoint was installed on the bridge where passes had to be presented in order to gain entry into town. Decorated with four art nouveau obelisks, the Zwierzyniec bridge is lit up with stylish lanterns – and thanks to its beauty it was part of Łukasz Barczyk’s film Hiszpanka, which told the story of the Wielkopolskie Uprising. 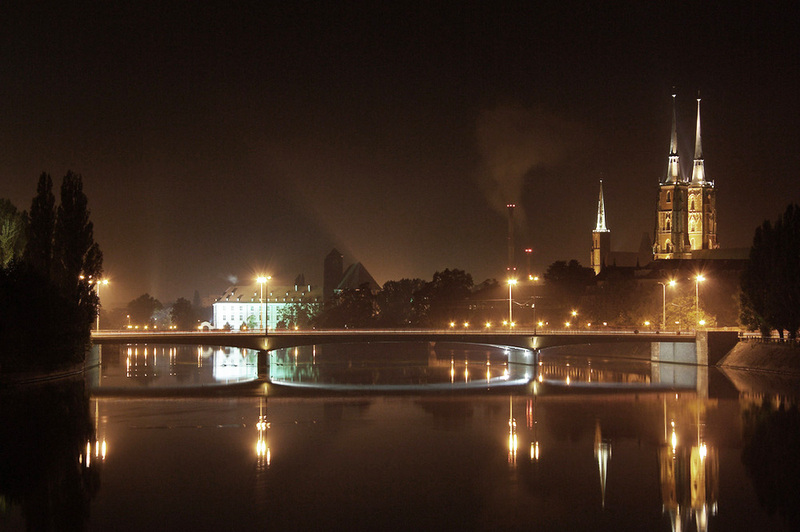 It is considered the Pride of Wrocław, and one of its most attractive tourist sites. It is one of the biggest bridges in Poland – 1742 metres, with an H-shaped pylon 122 metres tall. 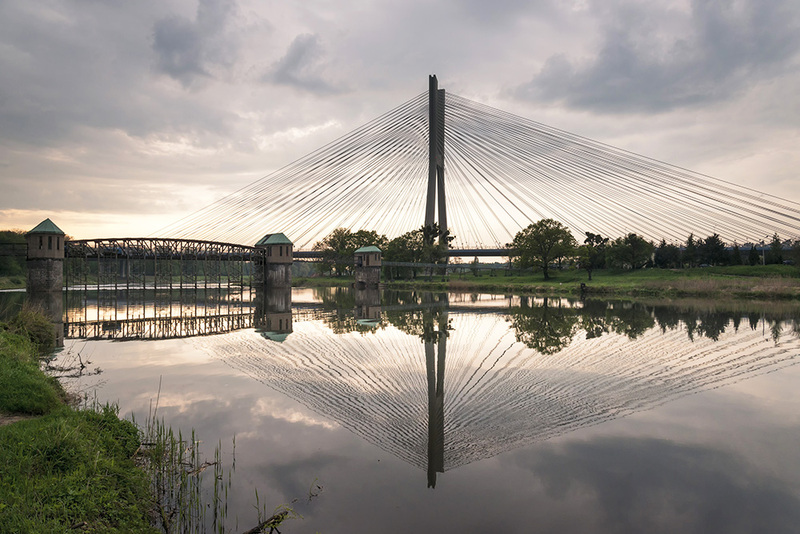 The designers of this modern giant have no doubts that Rędziński beats a whole series of records – the longest reinforced concrete suspension bridge, the longest bridge to be suspended on only one pylon, the bridge with the longest reinforced concrete span. Prof. Jan Biliszczuk, the bridge’s builder, even claims that this is the bridge with the largest surface in the world. See for yourselves. These bars are a sign that we are on the Piaskowy (Sand) Bridge, the oldest preserved water crossing of Wrocław. The first records of this water crossing date to the 12th century. A wooden bridge with bars, which includes one draw span and a defence tower made of clay lead onto the Church of Sacred Virgin Mary. The bridge was guarded by monks, who would collect a toll from merchants arriving in the area from the Czech Republic and Italy. Two international trails crossed by the "Pons ad Virginem Maria in Arena”, with many inns raised in the area for traders travelling the Amber Road. In 1861, an iron construction designed by Ernest Uber was raised on the site of Piaskowy, with dense, iron double railings. It resembled a similar bridge raised on the Royal Canal between England and Scotland – which had been the first such construction of its kind. The bridge in Wrocław was built in the Wrocławska Wytwórnia Konstrukcji Stalowych (Wrocław Steel Construction Manufactory). Mounted on four stone pillars, this monumental bridge was opened in 1875, after the unification of Germany and the founding of the German Empire, as one of the symbols of its renaissance. This modern construction took the place of the previous so-called Czteropfenigowy Vierpfenigbrücke (Four Pfenning Bridge). Its patron was a playwright of the enlightenment period, Gotthold Ephraim Lessing. The former name alluded to the toll taken by Pauline monks for crossing the bridge. In 1945, during Festung Breslau, two of the bridge’s four spans were destroyed and drowned at the bottom of the Odra rivers. The remains of the bridge only served pedestrians, and then, in the late 1950s, a completely new bridge was raised in the same place. This time, more than a thousand tonnes of steel were dedicated to Polish-Soviet friendship. The Old Town of Wrocław hides an island "archipelago" – one of the favourite leisure destinations of both tourists and locals. Leading onto the green Słodowa Island is the Słodowa footbridge – one of the 200 pedestrian and bicycle crossings in the city. Here, the wide mirror of the waters already looks onto the imperial castle. Here, a bridge crosses over the entire breadth of the river, with roads converging onto it from three old gates. The bridge is defended in the middle, as always, by a bastion raised on pillars, as well as a drawbridge. The bridge itself is built from strong oak beams. There is no better one in this country. M. Bartłomiej Stenus thus described old university bridges in 1512, in his Descripcio totius Silesie et civitatis regie Vratislaviensis. 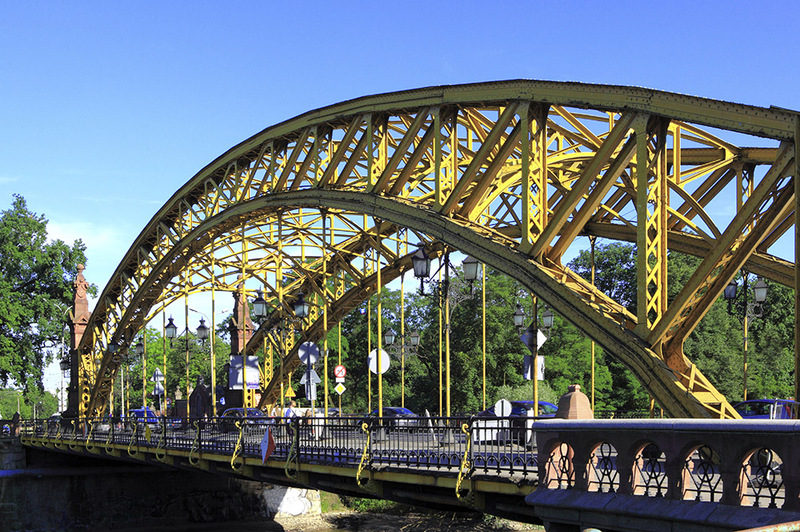 Back then, the wooden construction still bore the name Pons Viadri, meaning the Odra Bridge in Latin. Later, new names such as Most Środkow (Middle Bridge), Lange Brücke, and Most Długi (Long Bridge) also surfaced. 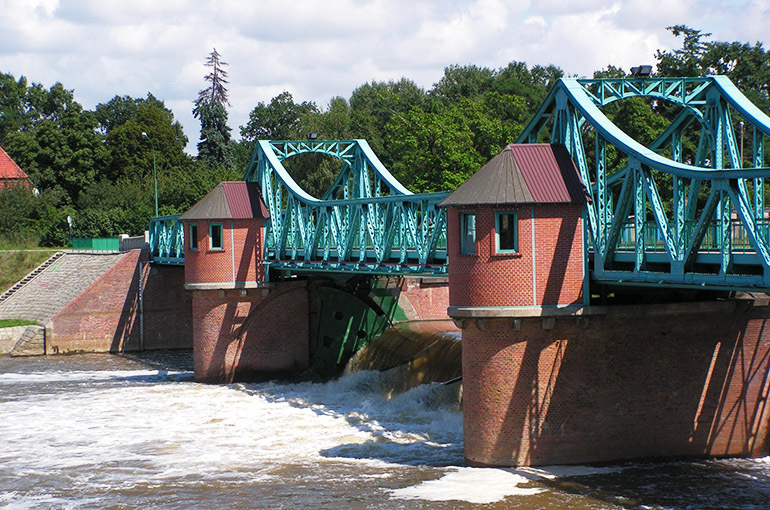 In 1867, a well-known Wrocław architect, Ferdinand Alexander Kaumann, decided to build a bridge fortified by stone supports and steel spans. The bridges lasted for some 66 years, and were destroyed during the Second World War. Measuring only 5.5 metres across, it is the most narrow bridge in Wrocław. It was raised between 1913 and 1917, when Wrocław was constructing a flood and shipping canal. Its steel structure, which was restored after the floods of the century, is 110 metres long.